brian habbe | life .. I got a call from a friend a few months ago saying he had a friend drop off some computer equipment and he didn’t know what to do with it. A few days later I stopped by his shop and what he had was a Dell PowerEdge 2800 Server. This is no run of the mill machine but server grade, 3 SCSI drives, Windows 2003 Server, and weighed 50 + lbs. The tub of incidentals was minor compared to this behemoth. I reluctantly took it not knowing when or if I’d have time to mess with it. Worst case I figured I could recycle it. It is a few years old, BIOS is from 2005, but should be able to run Linux. The first challenge was how to boot, it has no CD-ROM drive and the BIOS supports booting from a floppy not USB. So the only option that didn’t involve hardware was PXE. That seemed interesting since I haven’t done that before, sounded like a good experiment. To get that setup I followed this reference on the Ubuntu Community site. Next up was DHCP. My router serves it on the network so temporarily shut that off and enabled it on the server. Note to self here if you’re going to do that don’t assume you’ll have a network connection when you turn it of, change your settings to static before you do that. DHCP was a little bit of a struggle, it’s been 5 or more years since I’ve had to dive into the config files, but that was taken care of in about 15 minutes. With both of those pieces addressed I turned on the 2800, btw it sounds like an airplane about to take off for the first 10 seconds, pressed F12 when the BIOS information showed up and away we went. Once it got an ip address via DHCP the Ubuntu Server install screen showed up. The install went without a problem the only thing I didn’t do was try to configure RAID. With the drives attached via SCSI controllers Ubuntu saw one drive by default. Not a good thing as I can’t use the three hot swap-able drives as intended but I’m not sure I’ll be running this thing for anything so it wasn’t a big deal. Note: There was an option to configure RAID but I did not take the time to go through that. So the knock on ‘no RAID’ is probably me and not Ubuntu.. Yes it was a good experiment. 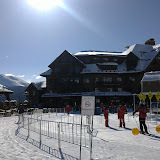 This years ski trip was to Breckenridge, CO a place I’ve been to a few times and it’s always good to go back. The group this year was 13 one of the largest since I’ve been tagging along. We stayed about 6 miles south of Breckenridge in a four bedroom three and a half bath house that could sleep 18. Even though the snow count was down this year it was still piled eight feet high beside the driveway. A couple highlights from the house were the hot tube wasn’t up to temp end of day one. That was kind of a bummer but after that it was no problem. A neighborhood dog showed up the morning of day five, he’d be back the following morning as well. He’d hang out on the front porch waiting for attention. We also saw a fox running through the back yard one morning, to quick to get any pictures though. I’d like to thank the folks at Alpine Sports Rental for another job well done on equipment. I can’t remember a time I didn’t rent from them and with the service they offer I’ll keep going back. We alternated between Breckenridge and Keystone, two days each place. It was cold the first day and windy the second. But by day three and four it was in the 40’s at the base and the sun was peeking through the clouds. A few nights we got some snow which was nice. Ironically though the last night we got six inches at the house, and it was still coming down when we left. If we’d only had one more day that would have been sweet!. It was an excellent trip and good to see all the guys again. No injuries, other than some sore muscles. Can’t wait to see where we go for 2014. More of a note to myself than anything else. If choosing to encrypt your phone use caution. I’ve got a Nexus S I don’t use very often, can’t give up the swipe UI on my N9 even though it’s showing it’s age, but it can run Jelly Bean and makes a good backup. So I try a few things on it every now and then and over the christmas holiday I decided to enable device encryption. On the plus side everything felt the same speed, battery life, UI response, access from the PC all good… but not when launching the camera. Pictures are stored on the sdcard but it’s not removeable, the internal storage is partitioned so a SD Card device is present. I could connect via USB and move files but when lauching the camera I’d only get a ‘cannot access SDCard’ message. I wasn’t using the stock ROM so if that was a limitation I’m not sure. I knew when enabling the only way to get rid of it was to wipe the device, so I was prepared. What I didn’t expect was a simple wipe in Clockworkmod wouldn’t do the trick. It wiped the device but also noted ‘cannot access /sdcard’. My first thought was I bricked it but some searching suggested options. For me fixing would be use adb from the Android SDK, mount the sdcard device with ‘parted’ and reformat the partiton. Easy enough and the excellent references on sites like stackexchange make following along pretty easy. I might try it again but should remember be prepared to wipe, may need to use adb, and always make a backup. 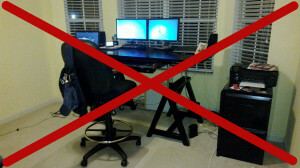 For the better part of 10 years now I’ve been telecommuting and have always had a traditional desk. Lately I’ve been reading about stand up desks and the positive impact it can have so with the Christmas holiday it seemed like a good time to give it a try. A few years ago we purchased a drafting desk to replace a rather large L shaped oak unit that adjusts to a variety of heights between 27 to 38 inches off the floor. So a new desk isn’t needed but my chair won’t go high enough. Ironically when we got back from visiting family yesterday the cylinder on ‘said chair’ isn’t working. I took that as a sign to go get a new one making sure it was a drafting chair. I picked up a chair from Office Depot and set out raising the desk as high as it will go to 38 inches from the floor. It would be better if I could get the desk to around 42 inches but the chair won’t go that high. Besides I’m not sure how much I can stand and type so it might not matter. Yes the desk isn’t normally that clean and if it doesn’t work out I can always go lower or back to standard. 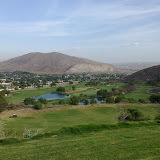 Last week I was in Anaheim, CA on business and had an opportunity to play some golf during a little down time. Not knowing the area a coworker and I got with another Supplier that had been wanting to play Oak Quarry for a number of years, it was the perfect opportunity so we tagged along. Created from an abandoned rock quarry in 2001 it is a site worth visiting and a course anyone would enjoy playing. We had a blast, even though I played like crap! The views are breath taking and the holes are challenging. Bring a few balls cause beyond the rough it’s unkept and you’re not going to wander into the weeds and brush wildlife, stickers and thorns will keep you on the course. If you play from the black tees you’ll be hitting driver from all the par 4’s, don’t let the first hole fool you. It’s better to stick with the blues or whites, that 20 yards will help a ton. Hopefully I’ll get back there and can play it again, regardless it was a great experence. If you’re ever in the area and looking for a place to play I’d recommend it.